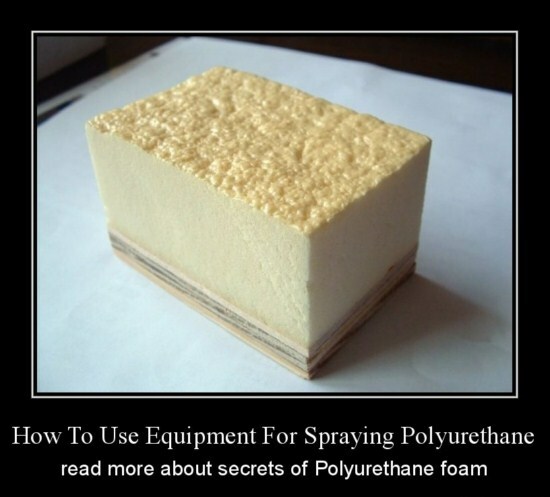 Equipment for spraying polyurethane allow to obtain high-performance foam insulation directly on the building site. The plants can be used as a mobile version and placed in the shop as a stationary casting machine. A wide range of foam generators for the polyurethane foam combines a single principle — is a modern, reliable, industrial equipment business class. The main purpose is to spray foam equipment. Foam insulation is the most effective way of insulation material (like Rockwool) has a low coefficient of thermal conductivity, does not absorb moisture, biologically inactive (does not rot, does not collapse). Polyurethane foam has several advantages: low thermal conductivity, good adhesion to any substrate, manufacturability (PUR foaming occurs after the mixing of two components). Typically, the primary use of polyurethane foam — is the construction industry. 2) Insulation foam object storage products (vegetable storage, grain storage, potato, cold stores) through the seamless application of polyurethane foam, including application of foam on the walls and ceilings of structures made of corrugated board. 3) Construction of pre-industrial and civil facilities with the use of panels of the «sandwich» with polyurethane foam insulation. Insulation of pipes (using ready-shell foam and insulation of polyurethane foam, or spray foam or foam filling under the pre-mounted enclosure).